The Report is available for free, but it would be great if you can support my work before Kona and during the year by donating an amount of your choice, for example the list price of a regular tri magazine (around 7$). 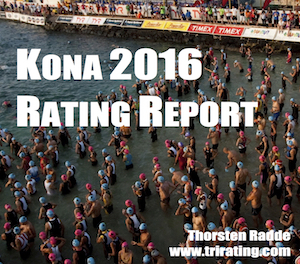 The Kona Rating Report is the ideal information to have when following the Ironman Kona coverage! “Interview: We get Thorsten ‘The Geek’ from TriRating.com on the show again. We talk about Kona and his amazing 2016 Kona Rating Report” in Episode 535 of the IMTalk podcast.